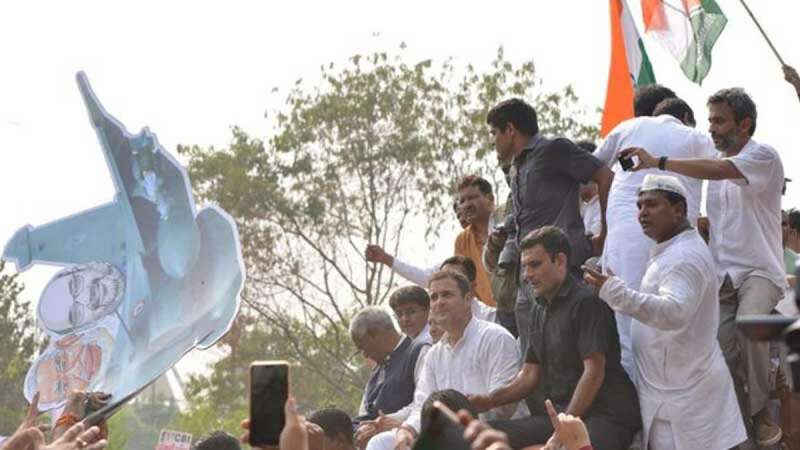 New Delhi : Congress President Rahul Gandhi on Friday led a noisy protest march by the opposition against the government move to strip CBI Director Alok Verma of his power, which he said was an attempt to prevent an investigation into the Rafale deal. The short march from Dayal Singh College to the CBI headquarters in south Delhi's Lodhi Road area was joined by several opposition leaders including former Janata Dal-United leader Sharad Yadav and Communist Party of India's D. Raja. An estimated 3,000 Congress activists took part in the protest, shouting slogans against Prime Minister Narendra Modi. Congress leaders also protested outside all Central Bureau of Investigation offices across the country. Uttar Pradesh Congress chief Raj Babbar led the protest march in Lucknow. Gandhi said on Thursday that Verma was "removed in panic" because he was going to begin a probe into the controversial Rafale deal that the Congress leader claimed would have been "suicidal" for Modi. In a dramatic midnight action, the government on Tuesday night divested CBI chief Verma of his charge and made Joint Director M. Nageshwar Rao the interim director. The Appointments Committee of the Cabinet (ACC) took the decision as the war between Verma and Special Director Rakesh Asthana escalated over bribery allegations hurled at each other. Asthana was also divested of all supervisory charges on Tuesday.